I was first introduced to Gloam on 2017’s Death Is the Beginning, which ably showcased their doom-infected brand of grimly majestic black metal. The single track on this split – Black Swords of Destruction – uses evil, malevolent melody just as well as those on Death Is the Beginning. These leads were somewhat of a key feature of Gloam’s sound previously, and although they’re more understated on this new song they still manage to wield this esoteric melody like a weapon of hideous destruction. Nasty underground black metal this may be, and quite savage in places too, it’s still obvious that this is a song that’s been thought about. Well-structured and paced, the song mostly focuses more on the band’s faster side than it does with the doomier aspects of their delivery. This doesn’t mean the song is all blast beats, of course, but it’s a more primitive, traditional take on black metal than we saw on Death Is the Beginning. However, as the track begins to wind down the pace slows, and the melody/doom increases, to great effect. 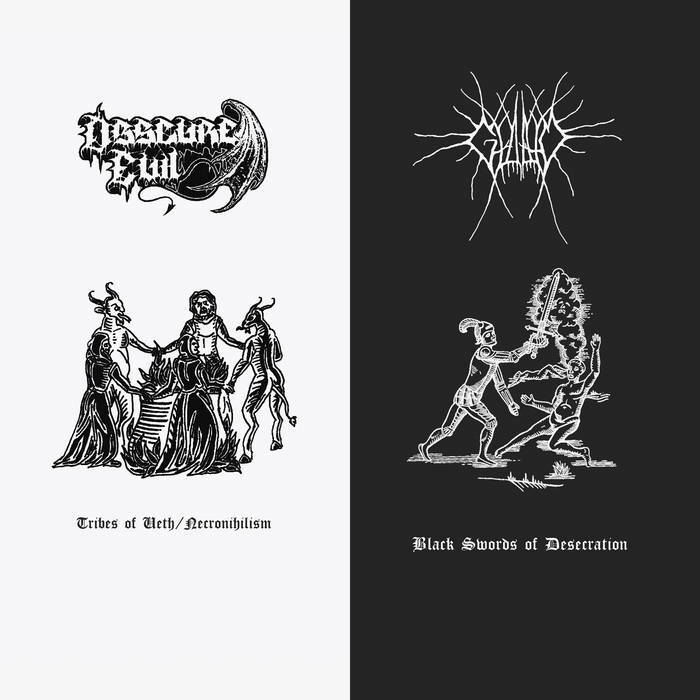 Obscure Evil play a brand of black metal powered by dirty thrash influences, and their track – Tribes of Ueth/Necronihilism – contains two songs gelled together into one, and is apparently the band’s final recorded output. This is a shame, as the band’s alcohol-soaked, blasphemy-riven blackthrash is quite endearing. Obscure Evil’s contribution to this split is energetically vulgar and full of aggressive attitude. Thrashing around like a maniac clearly works well for them, especially when channelled through atavistic black metal as it is here. Although I’m usually less enamoured with blackthrash than I am with most other black metal variants, I can still see that this is a decent example of the style. Obscure Evil certainly establish themselves well with these songs, and have a filthy, violent presence that they exploit to good effect. It’s a shame the band are no longer with us. Lasting a total of 16 minutes, this split is an enjoyable glimpse into just some of the things that are breeding, (and dying), in the black metal underworld. Check it out. This entry was posted in Black metal and tagged Black metal, Blackthrash, Doom, Gloam, Metal, Obscure Evil, Thrash metal, Traditional Black Metal. Bookmark the permalink.